2. Motorola looks to become about a $7 billion write down. Motorola is dragging down GM and Operating Margins, and given Samsung's profit share of Android handsets, there appears to be no profits in sight. Their Nexus brands are nice for the technocrats, but not making much head way in handset sales. 3. Search share has peaked. But search is over, right? 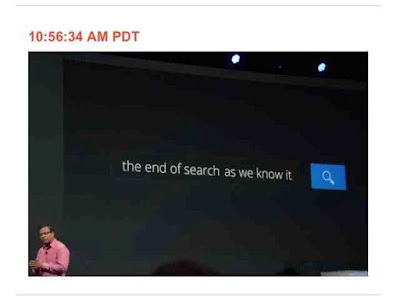 Or at least that is what Google declared at the I/O today. Despite the language Google tries to use, the vast majority of their business comes from search. The only difference between now and a few years ago is that "search" is now defined by desktop, mobile, voice and their "Google Shopping" (paid results). The bottom line is that voice search commoditizes desktop search (even if this push-pull is not yet seen w/in the data). And with Google pushing Google Now, voice search becomes an answer engine. There will be a transition to a new model of search advertising. 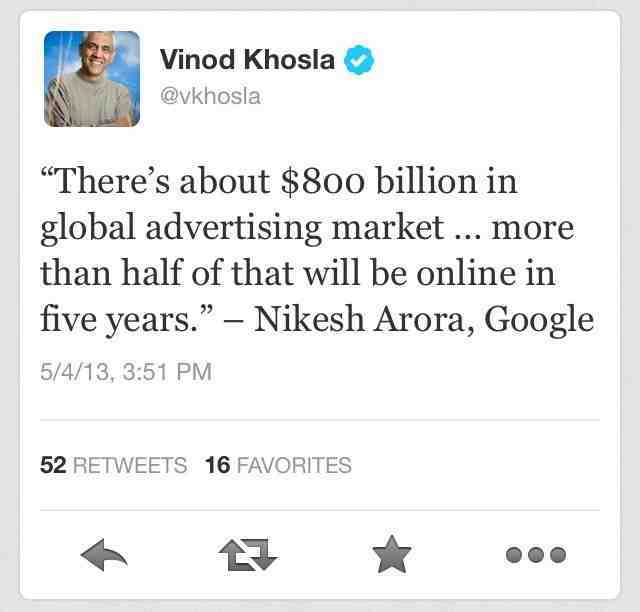 That could be through paid listings or incorporating daily deals when asking Google Now for a restaurant. Through out the I/O presentation, as we were all witnessing Google's transition into a closed-ecosystem predicated on a Google+ account, I kept thinking of the above transition. 4. Despite the above concern via traditional search, display and real-time-bidding are growing nicely for Google. But is it enough to justify the future expectations currently priced into the market? 5. Amazon is getting into the Ad game too. With Facebook and Amazon in the game, bringing different information to the table, not sure what this does to pricing. 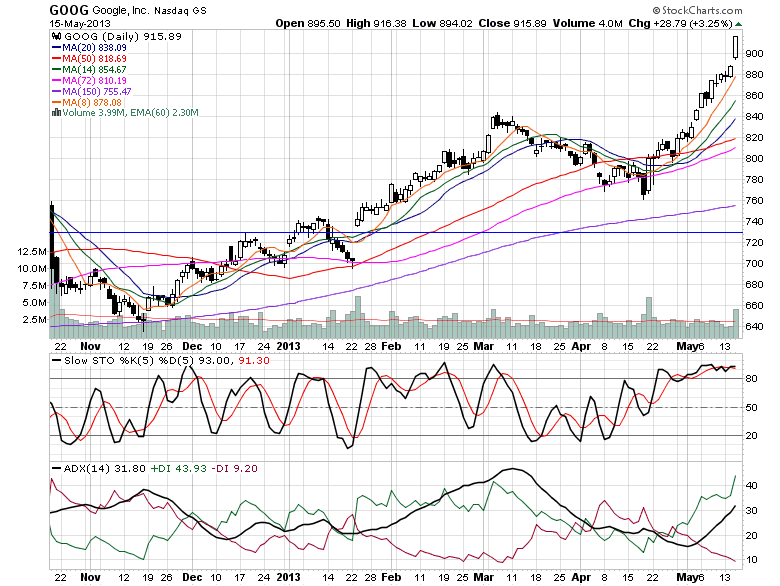 Google is riding awesome momentum, and should bounce around the upward trend. 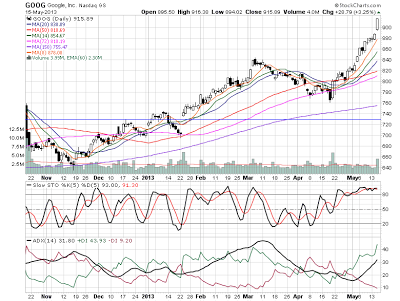 (This is why any shorts I take on will be a quick trade to any down side.) As the quarter approaches its quarter end, the momentum whores take their gains, and break the trend.